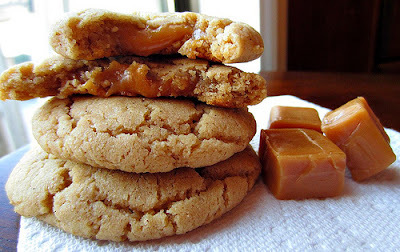 I should be spending this Saturday morning getting my fitness on and cleaning the tornado mess that is my house, but this recipe can't stay on my kitchen counter any longer. It HAS to be shared. This cookie means business you guys. It makes my heart swoon. I might ask it out on a date if it was socially acceptable. So far, it's my abs fave cookie. The combo of tart apple cider and gooey caramel just make it magical. Appley delicious. Caramelly delicious. I think I just coined two new words. I'd like to add they were especially fun to make. Stuffing the dough with caramels was like wrapping Christmas presents. Pure joy! 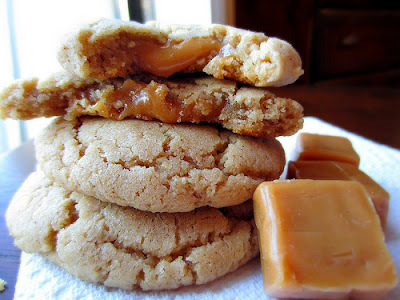 They are best when slightly warm so the caramel centers ooze when you bite into it. Just be careful not to burn your mouth. My impatience made me do it twice. Whoops! Preheat oven to 350° F. Line cookie sheets with parchment. With your mixer (or an energetic spoon) cream together butter, sugar, salt and all 10 packages of apple cider drink mix powder, until light and fluffy. Beat in eggs, one at a time. Add vanilla and mix well. When you are ready to bake, unwrap your caramels. Flatten the ball of dough slightly in the palm of your hand. 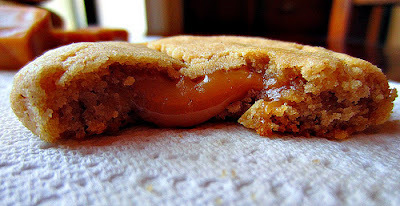 Press the unwrapped caramel into the center of your dough and seal the dough around it, covering it completely. Place on parchment covered cookie sheets 2 inches apart. Bake 12-14 minutes, or until very lightly browned around the edges. Please don't over-bake! Once the cookies are done, slide the parchment off of the baking sheet right out onto the counter. Allow cookies to partially cool on the parchment. When cookies are cool enough to be firm but still slightly warm, carefully twist off of parchment and allow to finish cooling upside down on the parchment paper. Don't leave them sitting for too long though or they will harden to the paper. 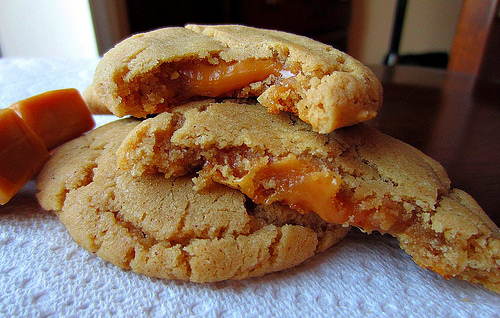 I'm gonna be kind of demanding now and tell you that you need to make these. They will make you smile and brighten your weekend. Or weekday. Maybe even your month. You get the idea.